Miiko Taka (高美以子, Taka Miiko) (born Miiko Shikata July 24, 1925), is a Japanese American actress best known for co-starring with Marlon Brando as Hana-ogi in the 1957 movie Sayonara. Taka was born in 1925 in Seattle, but raised in Los Angeles, California as a Nisei; her parents had immigrated from Japan. In 1942, she was interned with her family at the Gila River War Relocation Center in Arizona. After director Joshua Logan's first choice for the role of Hana-ogi, Audrey Hepburn, turned him down, he looked to cast an unknown actress. Taka, who at the time was working as a clerk at a travel agency in Los Angeles, was discovered by a talent scout at a local Nisei festival. Although she had no previous acting experience, Variety gave her a positive review in their review of the film. Warner Bros. gave her a term contract as a result of her performance in Sayonara. Taka married Dale Ishimoto in Baltimore in 1944, and they had one son, Greg Shikata, who works in the film industry, and one daughter. They divorced in 1958. ^ Makino, Jimmy. "A Japanese-American Nisei in the 20th Century". Retrieved 2012-06-20. ^ a b Scott, John L. (May 5, 1957). "Fortune Bolt puts Miiko in Top Film Spot". Los Angeles Times. p. E3. ^ a b c Capote, Truman (November 9, 1957). "The Duke in His Domain". The New Yorker. Retrieved 2007-08-09. ^ "National Archives: Miiko Shikata". Retrieved 2012-06-20. ^ "Sayonara". Variety. January 1, 1957. Retrieved 2007-08-09. ^ Scheuer, Philip K. (November 17, 1958). "Faulkner Story Lifted Off Shelf, Cycle Looms; Miiko Taka to Stay On". Los Angeles Times. p. B7. ^ Beyette, Beverly (August 12, 1983). "Toshiro Mifune Takes Up the Samurai Role Again". Los Angeles Times. p. G1. ^ Thomas, Kevin (November 28, 2002). "WORLD CINEMA; An edgy, epic collaboration; Director Akira Kurosawa and Toshiro Mifune made 16 films together; 13 will be screening at the Nuart". Los Angeles Times. p. E16. ^ "Actress Miiko Taka of Movies Wins Divorce". Los Angeles Times. November 18, 1958. p. B1. ^ "Miiko Taka Gets Divorce". New York Times. November 17, 1958. ^ Paddleford, Clementine (November 17, 1963). "Barbecue at the Table". Los Angeles Times. ^ Ishino, Maggie (September 23, 2016). "MAGGIE'S MEOW: MIIKO TAKA OF THE FILM 'SAYONARA'". Rafu Shimpo. 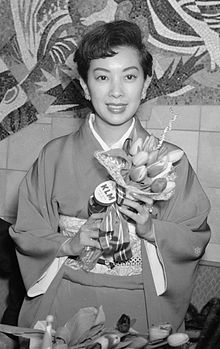 ^ "Miiko Taka Filmography". fandango.com. Retrieved 2007-08-10. ^ "Miiko Taka". imdb.com. Retrieved 2007-08-10. ^ "Biography for Miiko Taka". Turner Classic Movies. Retrieved 2009-02-20. ^ "MAGGIE'S MEOW: MIIKO TAKA OF THE FILM 'SAYONARA'". Rafu Shimpo. Retrieved 2018-11-04. Wikimedia Commons has media related to Miiko Taka.